AIOTI’s WG-13 on Smart Building & Smart Architecture has held a constructive and intense meeting on Nov. 21-22 at the offices of UNSENSE in Amsterdam. 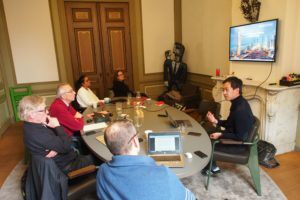 After an interesting presentation by Roger Tan on the actual works of UNSENSE we experienced a very essential and significant exchange of opinions, particular about the basics of what will – beginning 2019 – result in WG-13’s white-paper. Core of the discussions was the ontology of smart building, the ethical framework and the urge to address these issues in line with human values. Dit bericht werd geplaatst in blog en getagged architecture,conference; internet of things; home,ethics door martinpot . Bookmark de permalink .